The PrepExpress is made to operate in three ways- hold it in your hand, set over your pan or bowl, or set it on the counter. The device comes with three stainless steel cutting drums: a slicing, a shredding, and a grating or fine shredding drum. The food chamber, pusher, and drums can be removed for cleaning and are safe for the dishwasher. It features a 220 watt motor, single button activation (on the handle) and retractable cord. The PrepExpress is made to chop vegetables very quickly in the style of a salad shooter. You can crush nuts for flour, create chocolate shavings, or shred cheese. The chute is tilted, shaped to shoot ingredients into a bowl. It definitely does shred quickly. Unfortunately, the height of the opening will not accommodate most bowls. It also doesn't sit at an angle which will ensure ingredients fall into the container placed directly in front of it. It sprays a little. No matter what you shred, there is going to be some cleanup. I haven't heard anyone mention this, but to me, the open drum seems an encouragement to reach inside, something you are definitely not supposed to do. This is a strange looking device- like half iron, half food processor. That wouldn't be an issue if the performance weren't just as awkward. 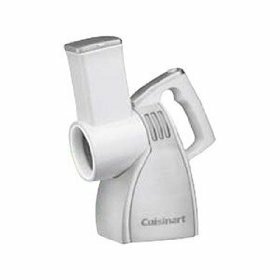 I saw a video where even the pro from Cuisinart had to hold it directly over a bowl to cut down on the mess, but that made it tough for him to press the pusher to force food through. He did have a tip: use less pressure to shred softer items. That doesn't seem to have helped the people who find that the machine mashes all of their food. Finally, it is difficult to clean as food becomes trapped in several places inside the unit. A mixed result for Cuisinart.